Monday Dose of Market: Cornucopia of Local, Part 2. As promised, here is Part 2 of Cornucopia of Local, a holiday market sponsored by the Boulder Farmers' Market, the Boulder Outlook Hotel, and  the Boulder Independent Business Association held on November 21st. In addition to the multitudes of vendors, a series of panels were held, featuring leaders of the Boulder County local food movement. If  I could describe the folks involved in this event in one word it would be: passionate! 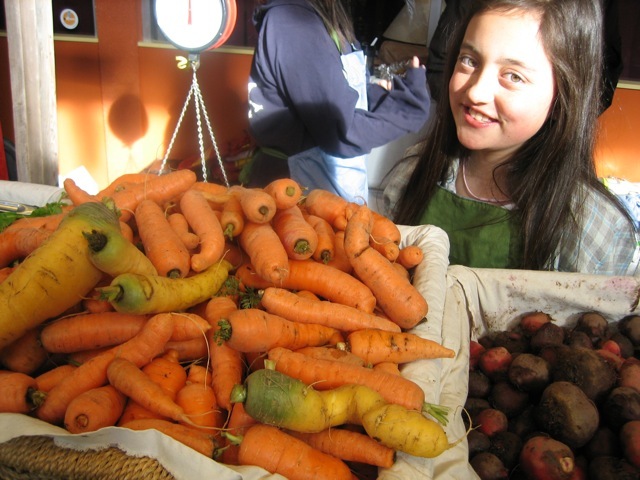 Starting with Izzy, who was tending the first veggie booth at the entrance of the Boulder Outlook Hotel. She's part of the Cultiva! Youth Project. For more pictures, please visit The Weekly Veggie. Thanks for visiting!